Do you have time to bake? Well, probably not. But, the thing is, a freshly baked chocolate chip cookie is a real treat. There are so many wonderful things about baking something delicious and having it be a project. First of all, you get to watch the ingredients come together, more than the sum of their parts. And then you get to lick the spoon, and have the lovely smell that emanates from the oven. Wow. Then you wait for them to cool, and then there is nothing like that taste. Nothing. Baking does take planning. First, you need to check that your oven is working. Most people don't realize they have a broken oven until Thanksgiving. Then, you have to buy the ingredients. After both of these steps, and the recipe below, you are ready to go! 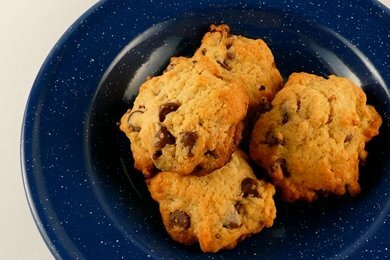 A homemade chocolate chip cookie has about 80 calories. But, remember, you will use eggs and butter, both have nutritional value. So, go for it once in a while. They beat a packaged cookie every day of the week. Kids love to make cookies. Just let them do it, and deal with the mess. It's much more fun than yelling at them as the eggs hit the floor. There is usually a recipe on the side of a bag of chocolate chips. If you are watching your weight, make a small batch. That way you can avoid eating too many. Want to compare to packaged cookies?